My 13 year old grandaughter Jordyn has done her room in hot pink and black with white polka dots and wanted me to make her a decorative pillow for her bed. This is a little larger than what I'd planned, but here is her pillow so far. I'm still waiting on some white tassels I ordered to sew on the ends. I decided to try to make a fabric rosette using the same fabric as the pillow. My first one ever....didn't turn out too shabby if I say so myself :P Burnt my fingers a couple times on the glue gun but it's not the first time and won't be the last. My surgery for the new pacemaker has been cancelled for Monday. Not happy about that, but nothing I can do. It has been rescheduled for the following week, the 28th. 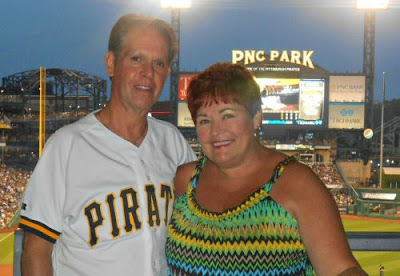 Last night hubby and I went to a Pirates game. We had tickets for a suite, so it was REALLY nice. We had a great seats between home plate and first base. We are meeting some friends tonight for a few drinks and to listen to a local Blues Band.